The cowries have always been a collectors favorite. No other family of shells comes close in popularity. It is no wonder since they are shiny, colorful, elegantly shaped, and come in a myriad variety of colors and patterns. The French call them by the beautiful name, porcellaines. The cowries are true works of art. The cypraea are dwellers of the tropical seas (with some exception) with the largest concentration and variety of species in the Philippine islands. Most are nocturnal and are reef dwellers. Their mantle envelops the shell thus preserving the glossy surface. The color pattern varies and may be mottled, blotched, spotted, freckled, banded, striped, ringed, or various combinations or even solid. In size they range from several millimeters to our own giant Cypraea cervus that can grow up to six inches. Twenty-four different specie of the smaller sized cypraea are included as our February Shell of the Month. 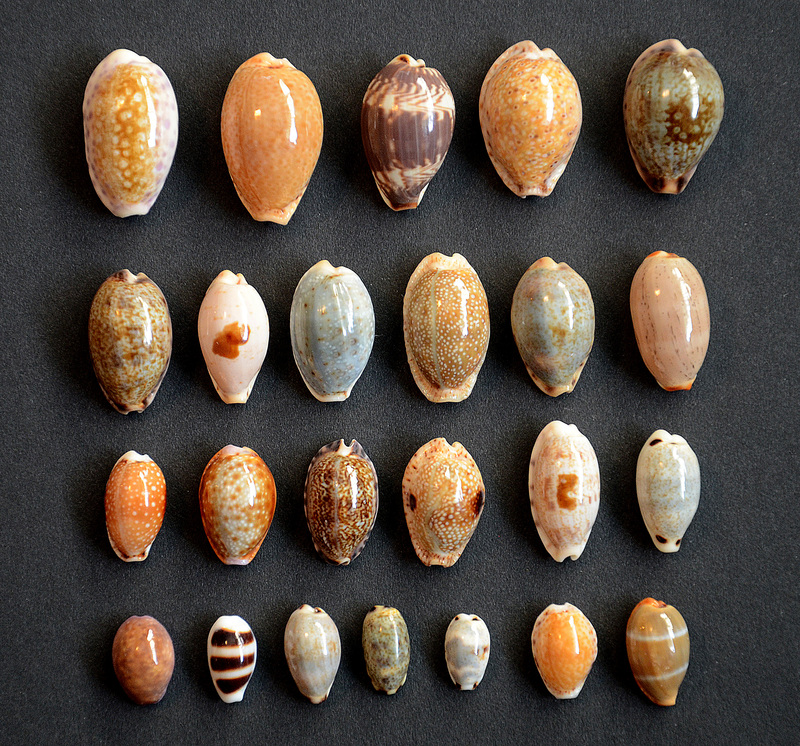 Although this selection is intended as an introduction of the collecting of cowries, the is plenty here to interest even the more advanced collector such as the giant Cypraea spurca from Turkey and the unusual blue Cypraea robertsi from Ecuador. How many of our members posses a shell collected in Turkey? Anyone? The rarest shell in this collection is the very difficult to obtain Cypraea vrendenburgi that comes only from Indonesia.